The Dusi Canoe Marathon, considered the world’s most prestigious kayak race, takes place every year between Pietermaritzburg and Durban in South Africa and covers a stretch of 120km along the Msunduzi and Umgeni Rivers. Even the best of paddlers regard the Dusi as one of the world’s toughest canoe events, but these four brave paddlers have added another, virtually impossible, challenge to their race. 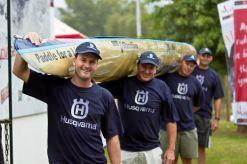 They have taken on the gruelling rapids of the 120km route in a K4 four-man kayak. Competing in the race in a K4 vessel is a difficult task as the tight corners and rapids of the Umgeni River aren’t suitable for such canoes. “We know it is a near impossible task and one heck of a challenge, but we decided to take it on because we feel so strongly about this cause,” says Shane Wright. 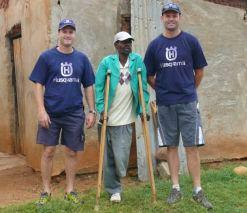 who would otherwise never be able to afford artificial limbs.